Sectional garage doors are designed for installation in private or in public garages and parking lots. Sectional garage door is made of "sandwich" panels consisting of two 0.5mm outer layers of deep galvanized steel and polyurethane foam core with a total thickness of 40 mm. On opening sectional garage door does not occupy additional space or the garage. 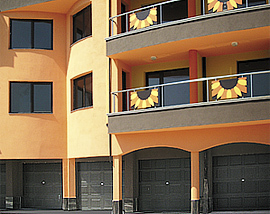 Sectional garage doors are manufactured in size and configuration specified by the customer. The parts which are produced for all sectional garage doors imported from the EU that meet all the requirements of European standards. LOGEL Ltd. sectional garage doors are tested in the laboratory notified by the registry of the European Commission and have CE marking. All the tests have achieved excellent results in full compliance with the requirements of the harmonized standard EN 13241 – 1. 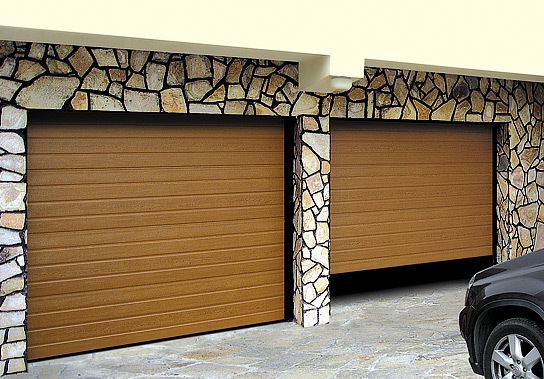 All standard sectional garage doors are available in white and "golden oak" with a striped print. 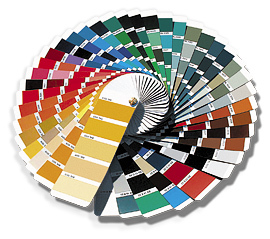 The doors can be painted in any RAL color up on request. Safety Edge: Stop the closure of a sectional garage door when encountering obstacles - one subject and more. Panels construction type preventing finger pinching. 5. Photoelectric sensors to secure closing of the garage door.